Sue is a highly skilled chef and she has worked in some of the country’s top kitchens. During her time working in restaurants she got a real feel for sourcing and using quality ingredients to create dishes for customers. When it comes to cooking, Sue is extremely creative and loves to experiment with new flavours. She is always looking to put her own personal touches to the latest trends – making them even more spectacular! We managed to convince Sue to leave the kitchen for a few minutes – to find out more about her role and how she got started in the food industry. Where did your interest in food begin? I’ve always had an interest in food, my father was a whiz in the kitchen at home when I was a kid and from an early age this love of food rubbed off on me. When I was at school I liked to cook, and wanted to learn more about food so I knew early on that a professional course was a good approach. 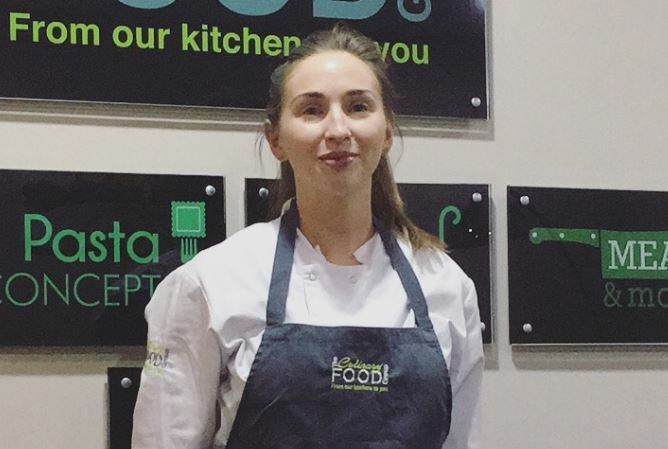 I went on to study Culinary Arts in College and over the past 10 years or so I’ve built up a lot of experience working in Catering, Restaurants, and Cookery schools throughout Ireland. I’ve always worked in businesses that have a focus on a really high standard of food and it’s great to work with quality ingredients. In Ireland, we are lucky to have many wonderful local ingredients to work with. I had always had an interest in New Product Development but was keen to get industry experience first as a chef so I began working in restaurants and realised I was hooked on this industry! When the opportunity came up to work in New Product Development with a leading food manufacturer I knew it was a role I’d love. The Culinary Food Group was a great fit being so Culinary led and allowing the team here the opportunity to be innovative and keep on top of current food trends – that really appealed to me. We create bespoke sauce solutions, filled pastas and ready to cook meals & value added meat products in response to customer requests. We’re very fortunate to have access to a range of amazing stocks from Simply which really allows for a unique quality in our products. Our focus is to provide customer satisfaction with culinary led development and quality bespoke products. We always keep on top of current market trends and regularly review current market products. I work with several key customers in product development around their specific needs – whether this involves the development of a new product or an update of something they are currently offering. We often deliver customer presentations which is a great way to showcase our capabilities as a business and to showcase new product ideas and stay focused on current trends. In an ever-changing market place, we always keep an eye out for what may be “the next big thing” across both the retail and food service sectors. I am very lucky to work in a role that is varied and work with a talented team with vast experience in both restaurants and food manufacturing industry and we all sharing a passion for food – each day is different and it keeps the job really interesting! Over the past few years there’s been a big increase in demand for gluten free products such as ready to cook meals and pasta dishes. Initially a lot of the products already in the market place received a bit of a bad rep from consumers. We’ve worked really hard on changing that opinion and have created some stunning gluten free options that are really popular with consumers. Our gluten free filled pasta is to die for if I may say so myself!! I think it’s fair to say now that modern consumers are extremely well educated especially when it comes to food and healthy eating. We’re very conscious of this and always keep it in mind when developing new products. From an industry perspective, it’s so important to remain current and keep up to speed and ahead of trends. The nature of the industry is one that is ever changing so keeping on top of market trends is essential. What’s trending at the moment then? As I say healthy eating is a big one at the moment. We have seen a big push towards healthier diets in the past number of years and this is something that is continuing to grow in popularity. Consumers are taking more of an interest in what’s in the food they buy with many looking towards the health benefits. They want convenience but with the added health benefits. Health claims on packaging is something we are seeing more and more of. As chef’s we’re keen to keep an eye on salt and sugar levels and we strictly adhere to guidelines. We also look at healthier alternatives to these to improve flavour profiles while designing specific products that may be low in salt and/or sugar. High protein diets are also in vogue of the moment. Broths are another trend increasing in popularity while at the same time tying in with healthy living. They are deliciously flavourful and comforting while also tying in with the healthy eating trend as they tend to be high in protein and nutrient dense. Exciting dishes like Poke- a Hawaiian dish which consists of chunks of raw fish marinated in soy and sesame and served with vegetables, avocado, salad are selling really well. Simple, tasty and healthy dishes like this are popular with consumers at the moment. Seaweed, believe it or not, is also trending – it’s been used on restaurant menus for the past number of years but is now making an appearance in retail too. It is an excellent product in terms of flavour delivery and also of course it’s famed for its health benefits so it ticks a lot of boxes. Comfort food is making a comeback too, be it a familiar classics or classics with a modern or healthy twist – the consumer is seeking out superior quality classics. Indian street food and traditional Indian flavours are on-trend which is not surprising with such vibrant and delicious flavours. Other cuisines we are likely to see more of this year include the rise of Korean and Mexican foods and Filipino and African flavours are likely to make an appearance too- so definitely some exciting flavours to look forward to trying and plenty of great foods to keep us on our toes!